If you’ve read Notes recently, you know the pension fund crisis is one of our major themes. Simply put, these giant pools of capital responsible for paying out retirement benefits to workers are BROKE. According to the World Economic Forum, pension funds around the world are short around $70 TRILLION. State, federal and local pensions in the US are $7 trillion short… and a recent report by Boston College estimates 25% of private US pensions will go broke in the next decade. This is all happening because investment returns have been too low. Did you know? You can receive all our actionable articles straight to your email inbox... Click here to signup for our Notes from the Field newsletter. Pension funds need to earn about 8% per year to meet their obligations. And they traditionally do that with a conservative mix of bonds and stocks. But with interest rates near the lowest levels ever, it’s impossible for pension funds to achieve that 8% with their usual tools (over the past year, they’ve only been earning around 5.5%). Illinois, one of the brokest states in the US, actually wants to issue billions of dollars in bonds to plug the hole in its pensions. Since 2008, public pensions have increased their allocation to risky assets by 10%. 10% may not sound like much, but it’s a huge move by these conservative funds. It translates into TRILLIONS more invested in exotic speculative investments. So while the teachers and firefighters of the world are counting on pensions to conservatively invest their retirement savings, they’re trying to flip speculative real estate to juice returns (that strategy has actually increased sixfold). Pensions are broke. They know that they will not earn enough money to pay their obligations. So they’re swinging for the fences. They don’t have another choice. Sure, piling into risk assets has juiced returns for the past decade. But we’re now 10 years into the longest bull market in history. And basically everything is expensive today (particularly stocks and real estate). (Dalio also warns of higher taxes, something we’ve talked about before). And GMO, a world-class asset manager with a stellar track record, expects -2% per year…a far stretch from the 8% expected returns pension plans need. Now, I’m not saying that the markets are going to crash tomorrow, or next week – or even this year – but at this stage of the cycle, taking on substantially more risk is ridiculous. By the way, the same is true for individual investors. In fact, about 18 months ago I started recommending our readers consider accumulating cash. Sitting on cash when the markets hit bottom is a once-in-a-decade opportunity to get really rich. I’m personally sitting on more cash than I ever have in my life…(and it turns out cash was the best-performing asset of 2018). But pension plans are doing the exact opposite. They’re going all in on risk assets at the top… because they have no other choice. And they are completely unprepared for what’s coming. Pension plans themselves expect to earn 7.4% per year for the foreseeable future (already a full 60 basis points below what they require). Their worst-case scenario return is 5.4% a year… I don’t know what their worst case looks like. But considering the potential for trade wars, a global slowdown, political infighting, nuclear war… 5.4% seems outright rosy. There’s a high probability we see stocks plunge 40-60% this year or next. But pensions are living in some parallel universe where they’ll continue to earn 5% a year. Of course, gambling the savings of regular working people at market highs will only lead to one thing… catastrophic losses. If you want proof of that, look at what happened in Japan last week, home to the world’s largest pension fund. Its Government Pension Investment Fund lost $136 billion dollars in just 3 months. The reason? A massive drop in the value of stocks and other “risky assets”(sounds familiar…?). That’s the worst rate of decline the fund has ever experienced. Pension fund managers are oblivious to reality… and this is how they gamble the savings of generations of workers. The contributions workers pay into the system are based on these unrealistic, overly optimistic numbers that have no way in the world of ever happening. Which means millions of workers counting on that money for retirement will never be paid. It’s clear as day: pensions are broke. The money they promised simply won’t be there. That’s why we think it’s critical you take things into your own hands. As an individual investor, you have options big pension funds don’t have – like investing in loans backed by assets (like wine, gold or real estate). Or you can simply sit on cash and earn 2% while you wait for the correction to go bargain shopping. And where things are today, we think these options make a lot of sense. Because... If you live, work, bank, invest, own a business, and hold your assets all in just one country, you are putting all of your eggs in one basket. You’re making a high-stakes bet that everything is going to be ok in that one country — forever. All it would take is for the economy to tank, a natural disaster to hit, or the political system to go into turmoil and you could lose everything—your money, your assets, and possibly even your freedom. 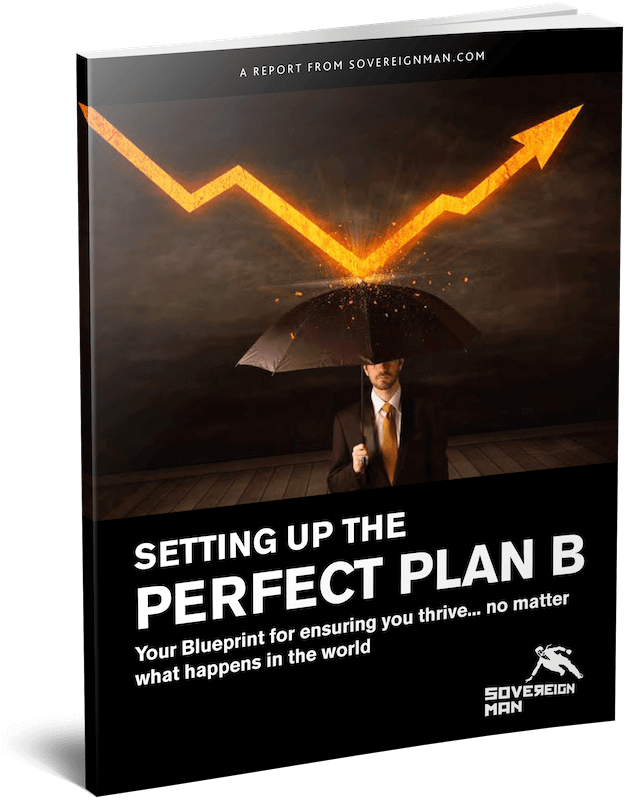 Learn about these and many more strategies in our free Perfect Plan B Guide.